Yippeee! 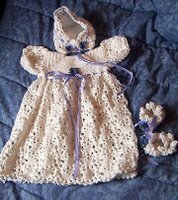 I am finally done the two christening/baptismal gowns for an order. I am quite happy with the way they turned out, I just hope the woman who ordered them is as happy! For the two gowns, it took 2 weeks, which could have been less if it weren't for: work, being forced by my 10yo to design something for her gameboy advance sp--watch my site for the pattern in June--AND that yucky 'H' word...housework. 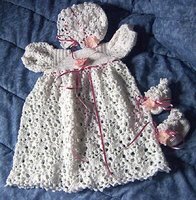 I will say, although the pattern is very well written, there were a few discrepancies which might provide difficulty for a new crocheter. On a few rows/rounds, stitch counts were off. Decreasing on the booties was vague, but not a problem for a more advanced crocheter. Brackets showing repeats were in the wrong place, but again, if you're not new to crocheting, it would only take a few min utes to figure that one out. Overall: I would buy (and do plan on!) more patterns by Rebecca-Leigh! For the flowers, the pattern called for ribbon roses, but I could not find any. The solution? Small silk flowers. I dismantled them, removing all plastic parts of the individual flower, then sewed them on using a bead in the centre of the flower. The buttons on the back of the dress (not shown) are pearl shank buttons. I just couldn't imagine any other button on the gown! Both are lovely, just lovely!! You should be so proud..
Those gowns are the beautiful crocheted christening gowns I've ever seen! Congratulations to you for your fine needlework and to the designer for her hard work at thinking up the design itself! Just beautiful!